I enjoy finding good books for my kids to read, especially for the kids ready for beginning chapter books. 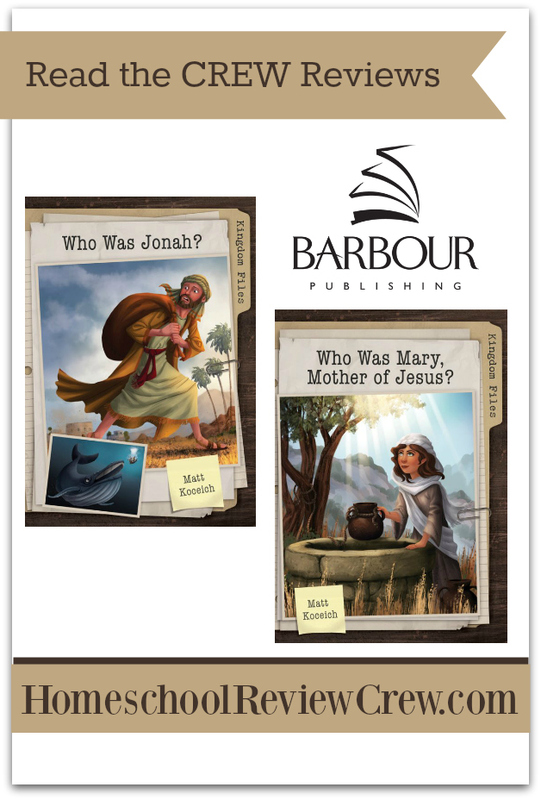 We recently had the opportunity to review two books in the Kingdom Files series from Barbour Publishing, written by Matt Koceich. These are ten short lessons kids can read to help them apply concepts and truths from the story to their own lives. One thing that makes these books unique, and helps explain the “Kingdom Files” premise, is the Fact File at the beginning, and the clues throughout. The Fact File shares basic facts about the character, along with a mini-timeline of that person’s life. Clue presented in offset boxes throughout the text highlight a certain point. They help us learn more about God, and make applications to the reader’s life. The kids enjoyed sharing these aloud at the end of our quiet Family Reading Time. The books were a good fit length and difficulty wise for my third-grade daughter. She could read most of the words by herself, and understood what she was reading. However, she did get stuck on some of the more difficult words. Some of these problem words were from the Bible – people and places she wasn’t as familiar with. Capernaum, and Archelaus are both examples of those types of words. Others were just longer words she wasn’t quite sure how to decode on her own, or wasn’t sure what they meant. These words included accommodations, ceremonial, and blaspheme. Based on length and vocabulary included, I’d estimate these books to be at a late third or early fourth grade reading level. So it gave us a good opportunity to talk about different versions, and to remind them that they can always go find the verse in their Bible if they want to know what a different version says. It’s important to remember and remind your kids that even though these are biography style texts, artistic liberty has been taken with these books. They are FICTIONAL accounts of a Bible story, and piece together many different events to tell the story of a person’s life. There may be differences between what they read and what the Bible says. When I read through the books before having my kids read them, I thought they were well written. They definitely promoted some critical thinking about two important Biblical people, including making you want to go read the Biblical account again. Who Was Mary, Mother of Jesus? I let my third grader pick which book she wanted to read first, and she selected Who Was Mary, Mother of Jesus. This book examined the life of Mary. It spans from the day she met the angel who shared she’d be having Jesus, to her final mention in the Bible, after Jesus rose from the dead. Mary is presented as a woman who followed God and trusted Him. The clues throughout help remind readers to focus on Christ and obey God. My third-grader thought it was a good story, and helped her learn more about Mary. She liked the clues throughout, and the Power File section at the back. We also reviewed Who Was Jonah?. This book features…Jonah! I read through this book, and will have my fourth-grader read it as well. As a struggling reader, it’ll take him a bit longer, but I think he’ll like the format. He’ll feel like a detective reading through it with all of the clues. This book provides an in-depth look at Jonah, and the type of person he was. It starts with him rejecting God’s command to go to Nineveh, and ends with the lesson God had for Jonah taught by the withering plant. As you read, you begin to see how gracious God is in giving second chances. The book reminds readers that God had prepared this great fish just for Jonah. He knew already what was going to happen, and what series of events would cause Jonah to need this fish. Nothing takes God by surprise, not even our disobedience. Prayer is also an important concept in this book. It talks about the importance of praying to help us know God’s will for our lives. One chapter talked about the crew of the ship, and how these events must have been life-transforming for them. They began the journey believing in multiple gods, and ended it with the knowledge that the God who created the heavens and the earth was mighty and powerful. That definitely gave them something to think about on their way home. I’d never really considered the crew before while reading through the book of Jonah, so that provided some challenges for me to think about. This disobedience of Jonah, God used to provide knowledge of Himself to this crew. The Power-Ups at the back of this book present good reminders for everyone. They include topics such as God cares, not being afraid to follow God, God’s grace, and the importance of prayer. I enjoyed reading these books, and will have my kids read them again. You have to remember that they are fiction. But, they are good books to help children think more about God and His role in not just these biblical character’s lives, but also in their own. I’d recommend them for kids in third grade through middle school. Older kids and adults might also like them – I even found some food for thought!